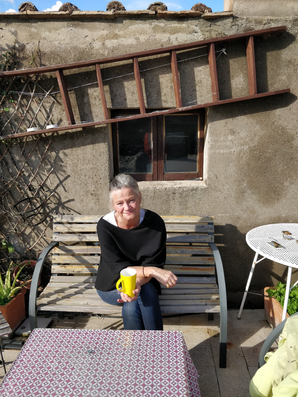 Bente has been staying at Circolo since the middle of October, and is finding it nice to back, even though the weather hasn't always been the best! The good thing about bad weather is that you don't really feel like going out and therefore have plenty of time to work on your different projects. Bøyesen is currently working on projects set to open to the public in 2019 and 2020. She wishes to continue on her previous project, House and Garden, which included for instance different objects found in her garden. The house from the 1880 in Son, Norway, has been a source of inspiration during the restoration when pieces of tapestry was found under the floorboards. The colours of the found objects were often white and blue, and these colours are also used in the rest of the artwork in that serie. Rome is a dear place to Bøyesen with all its contrasts. During a walk in the city you can experience a thousand years of history and architecture and the vast art history references are a source of admiration. When you can see the different layers of time it's a very special feeling. The Pantheon is her favourite, and under the Oculus you can experience something extraordinary. During the Autumn the flocks of birds that circle in the sky in the afternoon have treated everyone with a free spectacle. The birds have been a nice contrast to the noisy surroundings and Bøyesen says that you notice the nature and birds in a different way when you are surrounded by noise. If you ever make your way to Norway and Son, Bøyesen recommends you take a boat from Oslo to Son. The 2-hour trip is the best sightseeing you can get and you'll then arrive in a quiet fishing town, with a big harbour and lots of summer houses. Quite different to the endless row of Trattorias and food markets of Rome.